Dell's Venue Pro: Distinctive? Yes. But Will it Sell. Mashing mobile technology together with traditional PC designs has a hit-and-miss track record—cough, cough—but Monday, Corning announced that one of the more practical smartphone innovations out there is coming to touchscreen PCs, in the form of Gorilla Glass NBT. Gorilla Glass has become a mainstay on top-shelf smartphone releases thanks to its enhanced scratch resistance—a killer property when you’re poking and prodding your device all day long. While manufacturers have dabbled with putting Gorilla Glass coatings on laptops in the past—witness the Gorilla Glass-drenched HP Envy Spectre line, or numerous high-end Dell offerings—Corning hasn’t made a concerted effort to crack the laptop arena until now. With touchscreens regularly appearing on PCs these days, Corning is trying to transfer its mobile success to the x86 crowd. The new displays are stronger than traditional screens, too. In the amusing video above, Corning shill “Warren” demonstrates how the Gorilla Glass NBT screen is capable of withstanding having a notebook’s lid closed on a pen—an event that cracks a standard soda lime display. While you shouldn’t expect the arrival of Gorilla Glass NBT to give lagging laptop sales a shot in the arm, adding Corning’s steadfast screens to touchscreen notebooks should only make the mobile computing experience less frustrating—assuming the new display tech is as impervious as its mobile-focused counterpart. My touchscreen laptops already display scads of small feather scratches, and the cost of replacing a cracked laptop screen can easily go up to several hundred dollars. For “one to two percent of a notebook’s retail price,” as Corning announced the cost, I’d be surprised if Gorilla Glass NBT didn’t become a staple on premium notebooks, as Gorilla Glass has on smartphones. 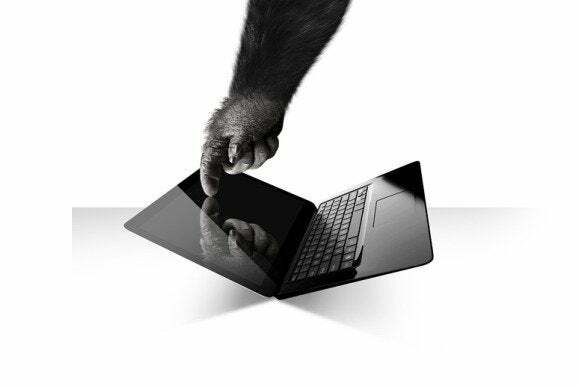 In fact, Dell is on board and plans to integrate Gorilla Glass NBT into the touchscreen laptops being released this fall, while Corning says it expects several laptops from several manufacturers to include NBT later this year.